DUSHANBE (Avesta news agency) — The volume of trade in 2018 between Tajikistan and other SCO member countries increased, with the exception of India and Kazakhstan. According to statistics, the volume of trade with SCO member countries for the period amounted to more than $2.9 bln, of which more than $2.35 bln was related to imports of goods from these countries. According to the source, during this period, commodity flows became positive in all SCO countries except India and Kazakhstan. The volume of trade with India in 2018 amounted to more than $20.4 mln, down 22.4%. This figure with Kazakhstan amounts to more than $836.5 mln. 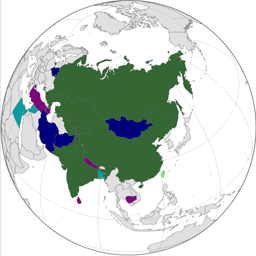 Tajikistan’s main trading partners in the SCO are Russia, China and Kazakhstan. Trade with these countries during this period amounted to more than $2.51 bln. On the other hand, there was a significant increase in turnover with Uzbekistan and Kyrgyzstan, with 2.3 times and 27.7% respectively. Imports of goods from SCO countries to Tajikistan are several times higher than exports, with the exception of Uzbekistan. In trade with Uzbekistan, exports exceed imports.